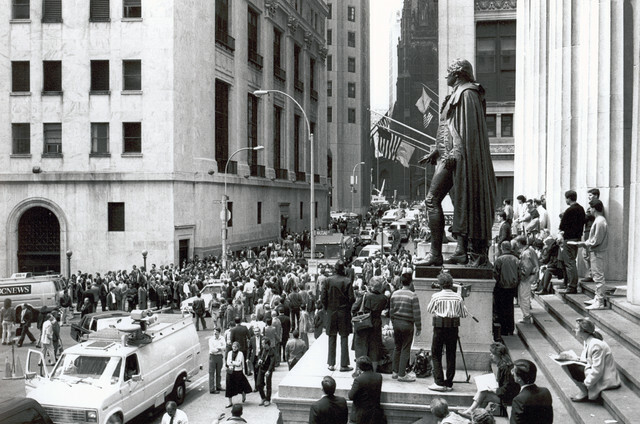 This past Friday was the 25th anniversary of the worldwide stock markets crash of 1987, often referred to as “Black Monday.” In that single day, the Dow Jones Industrial Average lost 22.61%, its greatest one-day percentage decline. 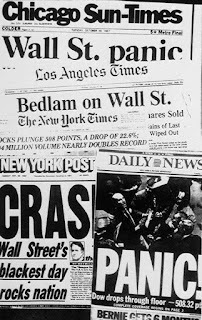 Obviously, there was widespread investor panic and fear, with many economists collectively speculating that “the next few years could be the most troubled since the 1930s.” In fact, it only took two years to recover this loss, and 1987 actually ended with a small gain. In many regards, Black Monday is the event that most encouraged me to begin Rollins Financial in 1990. I vividly recall receiving telephone calls from panicked tax clients that day (those were the days before communicating by email, texts, Facebook or Twitter). One client in particular expressed utter fear because the market was already down over 300 points at the time we were speaking and he saw no end in sight. I reassured him that if it was down that much, it surely couldn’t go down much more. I was wrong – the Dow declined another 208 points by the day’s end. After Black Monday, I committed myself to learning more about stock market investing and understanding market moves. I also wanted to better understand the stock exchanges’ relatively new utilization of program trading applications. Back then, computers were believed to be smarter than people since they react non-emotionally to the movements of individual stocks. By the end of 1989, I felt comfortable that I could be a successful asset manager, and Rollins Financial opened its doors inside Rollins & Associates’ office suite on January 1, 1990. 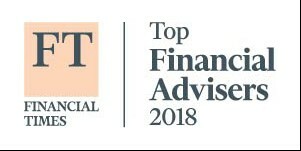 As our 23rd year in business draws near, my voracious appetite to learn something new each day continues, and in the ever-evolving world of finance, an asset manager can never know enough. To this day, many people believe that the stock market crash of 1987 was a result of “computers gone wild!” Program traders basically have specific and defined levels in which trades can be automatically initiated to take advantage of rapid market movements. 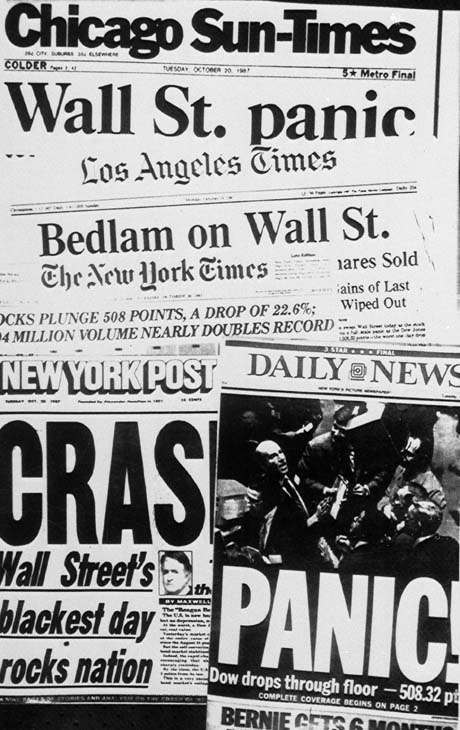 Until Black Monday, very few people anticipated that a crash of this magnitude could occur over a single day. 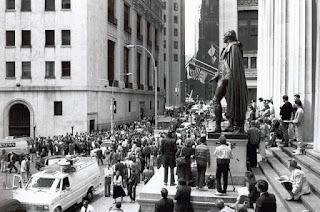 In fact, the Dow had reached a high of 2,722 points in August of 1987 – a 44% increase over 1986’s 1,895 point closing – and had been selling off precipitously in the six weeks preceding the crash. On October 19th, the market started selling off rapidly right at the opening bell. It’s believed that program traders broke through initial support levels and the programs instantly sold without regard to liquidity or any other intuitive measure that humans would have exercised. Suddenly, the programs were dumping stocks into an illiquid market with no buyers. At the end of the day, the DJIA’s 22.61% loss was the smallest of the losses in the developed markets. Hong Kong’s losses had fallen 45.5% by the end of October, Australia 41.8%, Spain 31%, The United Kingdom 26.45%, and Canada 22.5%. 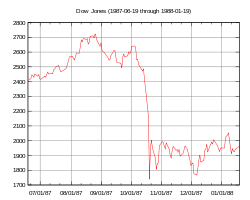 New Zealand was especially devastated, falling almost 60% from its 1987 peak. Looking back, it would be hard to classify Black Monday as anything short of a financial disaster. Assume that on Friday, October 16th, you had been unlucky enough to invest 100% of your capital in the stock market. The DJIA closed at 2,246.74 that day, and by the closing bell on Black Monday, had declined further to 1,738.74 points. Even though 22.61% of your capital had gone to “stock market heaven,” you did nothing and let your investments ride. Today, the DJIA trades at 13,344, which means that over the intervening 25 years, the money that you had invested would have made 7.38% annually, not including reinvested dividends. If you include reinvested dividends, you would have made 9.98% annually. To further illustrate my point, if you had invested $100,000 on Friday, October 16th and did not touch it in the following years, that investment would be worth approximately $1,078,000 today – a nearly 1,000% gain! At a rate of 9.98% annualized, you would have earned a rate of return in excess of five times the rate of inflation over the intervening 25 years. Even more extraordinary is that over the last decade, there have been numerous market sell-offs, including the terrible stock market of 1990 and 1991. Additionally, who could forget the tech bubble burst of 2000 and the 35% loss the stock market suffered in the financial meltdown of 2008? Even with these major swings, you would have earned nearly 1,000%. Furthermore, if you had invested your $100,000 before the crash and you had added an additional $1,000 each month thereafter over the subsequent 25 years, then as of today, you would have invested a principal total of $400,000 ($100,000 plus $300,000 invested on a monthly basis). Including earnings, your account would be worth an approximate whopping $2.5 million today! This approximation is based on average gains and not actual year-to-year gains. There is no stronger argument for long-term investing than the foregoing examples. Clearly, the potential for creating wealth through stock market investing should not be disregarded. Hardly any other investment class comes close to this potential. So, the next time you wake up in a cold sweat in the middle of the night and think you have a good reason for selling to cash instead of remaining invested, I hope you will think about the examples above. Concisely, market timing is a failed investment strategy for investors seeking long-term wealth. Historically, September is the worst month for stock market performance in any investing year. After considering the historical data, I forecasted the month of September to be flat or even negative from a performance standpoint. Fortunately, however, I was wrong! September was an excellent investment month, adding to what has been an excellent investment year thus far. For the month of September, the S&P Index of 500 Stocks increased 2.6% while the NASDAQ Composite gained 1.7% and the Dow Jones Industrial Average gained 2.8%. This performance is quite impressive for a month that has historically had negative performance. Not only was September an excellent investing month, the entire quarter was also exceptional. For the quarter, the S&P 500 was up 6.3%, the NASDAQ was up 6.5%, and the DJIA was up 6.1%. Clearly, the 3rd quarter of 2012 will be remembered as a remarkable financial quarter. Performance like this makes me even more amazed at the number of investors who are earning next to nothing by sitting in cash. Even though there is a great deal of negativism regarding the U.S. economy, the U.S. and the international growth prospects have provided a great investment year thus far. The S&P 500, through the end of September, is up 16.4%; the NASDAQ is up 20.7%, and; the DJIA is up 12.3%. I previously projected that 2012 would have returns for the entire year in the middle double-digits, and so far, that prediction is on-target. I am baffled that so many investors have entirely missed out on this rally. Since the market low of March 2009, the broad market is up 120%. It’s hard to believe that with all the turmoil and negative press, the DJIA is now only 4% below its all-time high reached in 2007. The S&P 500 remains 6% below its all-time high, and is threatening to reach that high level in the coming months. And yet, there are many investors who have completely and totally missed this opportunity to increase their wealth. Since 2008, when the broad market was down almost 40%, almost a half-trillion of investment dollars have been withdrawn from equity funds, net of money added to equity funds. The public is clearly running away from equity investing, even as equities continue climbing higher. All too often, individual investors completely miss the big picture by exiting the market when times are bad and then fail to reinvest when times are good. Oddly, many investors refuse to invest in the market when stocks are cheap and “on sale.” People flock to retail stores to get small discounts on goods, but when it comes to the stock market, investors tend to run in the other direction. When stocks are cheap, few people invest. But when stocks get expensive, everyone wants a piece of the pie. And that is exactly why the average investor needs professional advice when it comes to investing for their retirement years. A recent Franklin Templeton Mutual Funds study pointed out how completely wrong the public is about investing. They asked a group of 1,000 investors about their perception of the stock market’s recent performance. Stunningly, more than 50% believed that the market was down in 2009, 2010 and 2011. Even more baffling, those polled were bona fide investors who were thought to have a handle on market performance. For the record, the S&P 500 was up 26.5% in 2009, 15.1% in 2010, and 2.1% in 2011. And, again, it is up 16.4% through September 30, 2012. Evidently, even investor perception of the stock market often contradicts the truth. To test whether or not you’ve been keeping up with the market over the last year, can you guess the performance of the three major market indices for the 12-months ended September 30, 2012? Perhaps you guessed that these indices are up 5%, 10%, or 15%. All of these would be excellent returns, but the correct percentages are even more impressive. For the 12-months ended September 30, 2012, the S&P 500 is up 30.2%, the NASDAQ is up 30.6%, and the DJIA is up 26.1%. All three major market indices have been in positive territory for the last five years – even when you include 2008’s awful sell-off. How many of you guessed that the returns are in the 25% to 30% range? Hardly a day goes by that I’m not asked for my opinion on what might happen in the stock market if President Obama is reelected. Public sentiment is that the market will adversely react if that’s what happens. Many also believe that if President Obama is reelected, the public debt will skyrocket another $5 trillion, that the country will be saddled with over $20 trillion in long-term debt, and that our national debt (other than during wartime) would exceed the U.S. GDP for the first time in history. I’ve often said in my posts that the stock market is “forward-looking,” and that you can’t invest by looking in the rearview mirror. The polls now forecast that President Obama will be reelected by a few percentage points, and the general presumption is that if that happens, the Republicans would at least retain control of the House and could gain control of the Senate. If this election yields another deadlock, then that would actually be favorable to investors. Since the stock market is forward-looking, you may rest assured that investors have already measured any effect that they believe President Obama’s potential reelection would have on the markets. Since the polls favor Obama’s reelection, investors have already traded to accommodate that result. On the other hand, if Romney is elected, the market could possibly move higher since many perceive him to be more business-friendly than Obama. Some of the best years investors ever enjoyed occurred when Washington was in political gridlock. Aside from our military, the government does almost everything poorly (e.g., the U.S. Postal Service, Social Security, and of course, Medicare). To be sure, it’s almost impossible for any president to simply turn the government battleship of gross negligence and its inability to function around overnight. There are incredible worries for investors to confront. Unquestionably, tax rates will increase regardless of who gets elected. Beginning in January 2013, payroll taxes will increase for almost all working Americans. Additionally, a maze of new taxes instituted under Obamacare will become effective. If Congress doesn’t deal with the fiscal cliff of expanding taxes at the end of 2012, the increased tax load would almost assuredly throw the country into a recession in 2013. The economy continues to rock along at 1% GDP, plus or minus. While there have been some signs that the economy might slip into recession during 2013, there have also been positive signs to the contrary. For instance, car sales have been excellent. Even though these sales are led by foreign automobile manufacturers, the cars are actually being built in the United States by Americans, which is very positive. With the slowing of the European economy and a pronounced slowdown in China, however, it is perfectly possible that the very fragile U.S. economy could dip into negative territory. Nonetheless, I anticipate that we will see the economy continue on its positive path, even if at a very low level. I wouldn’t be surprised to see GDP below 2% for the rest of 2012, and for at least the first half of 2013. All politicians talk about taxes – seemingly, President Obama wants to increase taxes on almost everything, and Mitt Romney speaks ad nauseam on his plans to decrease taxes. However, neither the incumbent nor his opponent has actually discussed spending cuts. If the federal government would cut spending, perhaps making changes to tax law would be moot. There’s been an explosion of spending at the federal level since President Obama took office, and there’s been a corresponding explosion in deficits. However, Obama’s only solution seems to be higher taxes on the rich, but I can’t think of a single study indicating that this would make even a dent on the current deficit’s size. Investors also have to worry about Europe’s debt crisis. However, during the 3rd quarter, Europe has finally taken positive steps to deal with their economies. Unlike the United States, Europe is making positive austerity strides and their economies are slowly improving. They are attempting to reduce their social programs and deal with their fiscal issues. Unlike the U.S., they are at least trying to confront the issues. Unfortunately, the French Socialist mentality believes higher taxes are the answer to every issue. Have you heard that before?!? For example, France’s Socialist president Francois Hollande recently announced his plan for a 75% tax rate on individual incomes over €1 million. Hollande defended the new “supertax” as a component of his effort to reduce France’s deficit, but he says it’s also “symbolic,” and that he hopes “It will show an example.” It certainly wouldn’t be unusual to see an exile of those in the supertax bracket from France. According to French real estate brokers specializing in high-end properties, a glut of Paris residences worth more than one million euros ($1.3 million) were recently listed on the market. While Hollande’s supertax has generated the most headlines, it’s apparently the drastic increase in the capital gains tax rate (62.21%) that’s pushing most people to leave. How could politicians have such a narrow perspective on how tax rates affect a citizen’s desire to stay in a country? To be sure, George Harrison wrote “Taxman” when he realized how much money the Beatles were paying in taxes to the U.K. As a result, the Beatles (along with the Rolling Stones and The Who) spent a lot of time in America and other parts of Europe as tax exiles. While there are many issues to be dealt with – and clearly the economy is slowing to an almost break-even level – there is room for optimism. For instance, there’s an absolute explosion happening in U.S. manufacturing productivity right now. Due to the advent of new technology, productivity has allowed companies to produce at remarkable levels without adding employees. That’s not exactly great for workers, but it is good for the U.S. Contrary to popular opinion and what you may read in the press, the U.S. economy is the number one manufacturer in the world. We are even bigger manufacturers than China, which has four times as many people than the United States. Additionally, manufacturing companies from all over the world are coming to the U.S. to build due to our excellent skilled workers and higher productivity. Despite the Obama Administration’s desire to halt fossil fuel exploration, there’s been an explosion of oil and gas production in the U.S. Advanced technology is providing the ability to extract oil and gas from land that was once thought to be unattainable. Even though the current administration has fought attempts to expand fossil fuel exploration, it has occurred on private land to levels never deemed possible. My hope is that public land is eventually opened up for production of oil and gas, which would make North America more energy independent. The United States couldn’t possibly become energy independent on its own in the next few decades, but if our oil production is combined with Canada and Mexico’s production, North America as a whole could become energy independent in the next decade. By opening up government land to drilling, energy independence could be achieved. I still believe that the best investment months are forthcoming. It’s perfectly possible for the market to continue moving upward notwithstanding the presidential election due to high earnings and extraordinarily low interest rates. That’s not to say the market will never be volatile again – we know that’s not a possibility. However, the potential for middle double-digit gains this year has already been realized and may even be improved upon in the 4th quarter. Even if the year ended with the market exactly where it is now, it would be a great investment year. The possibility of reaching all-time highs in the major market indices is within reach over the next six months. I continue to be baffled by those who continue to invest in cash even after missing out on this 120% run-up. If we can assist you in understanding the market and gaining a better understanding of how to increase your potential for a more secure retirement, please give us a call.